As we continue to shift our perspective to begin the new year, I’m excited to share the words and ideas of few of my friends. I imagine us sitting on a bench with these interesting people and learning something new. Each one has a unique view of the world that makes me think differently. This week I’m sharing some thoughts from a wise friend in her late 90’s. She’s a humble women with many gifts, whom I greatly admire. Her outlook on life is an example of the type of proactive attitude and behavior we advocate for at MemoryMinders and is one I aspire to emulate. She prefers to remain anonymous but even so, I know you’ll appreciate her words as much as I do. 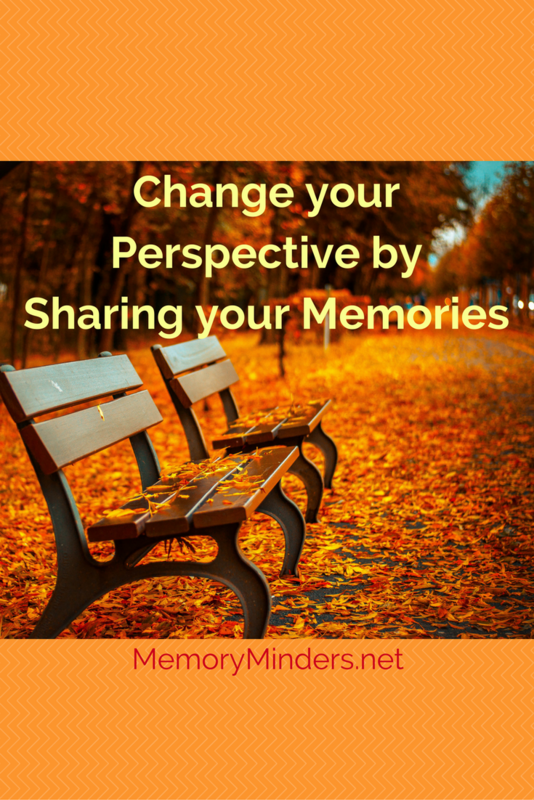 I asked her to reflect on memories and here’s what she shared with me…..
We cherish our memories. We should share them. Does your family know what your school days were like? What school supplies did you have? Did you carry a lunch to school? Who were your special teachers? Does your family know how you met your husband? What was you first job like? What interesting relatives do you remember that they never met? They may know some of these things but not the details. Write them down and share them. Physically writing or typing will also exercise your brain. Reading it back to yourself aloud is another good exercise. It will be an enjoyable exercise. It has been for me and my family looks forward to my next tale. I love these ideas from my friend as recording and sharing our memories is important as we age AND a great brain exercise! Using her examples and ideas-how can you share your memories this week? Let’s forge ahead this new year, cherishing and sharing our memories along the way! Your friend’s specific suggestions for savoring and sharing memories are wonderful! I hadn’t thought about the process of physically writing, reading aloud and using a dictionary vs spell check as ways to exercise my brain. Great! Thank you for including her ideas in your blog! You’re welcome and happy they helped you! Reading aloud is a great tip and so easy to do!